Gold cast in a mould. A gold coin worth a dinar. Inscriptions in kufic script appear on the obverse and on the reverse. The centre, obverse, holds a five-line inscription that reads: 'To God / Muhammad / Prophet / of God / Sanctioned by God'. 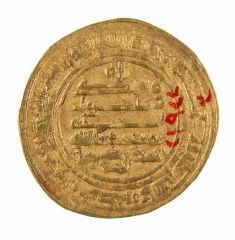 The margin, obverse, bears a circular inscription that reads: 'Muhammad, the Prophet of God. It is he who has sent his messenger with guidance and the religion of truth to prevail it over all religion even though it is hated by the pagans'. On the reverse, the coin bears at its centre four lines of inscription that reads: 'There is no God except / the One God / Who has no Partners / Authorised by God'. On the outer margin, reverse, there is a circular Qur'anic inscription (Chapter 30, 'Romans', verses 4 and 5): 'With Allah is the Decision in the Past and in the Future. On that day will the Believers rejoice with the help of God'. Along the interior margin, reverse, a circular inscription states: 'In the name of God this coin was struck in Egypt the year 268 AH' (AD 881). When Ahmad ibn Tulun ruled as Governor of Egypt (r. AH 254–70 / AD 868–84), he aimed toward the unity of the Islamic provinces, and in AH 266 / AD 880 was able to establish a large Islamic State. Due to the fact that numismatics was the most important insignia of authority and dominion, he undertook the enterprise of minting coinage in his name in order to affirm his power over the State. The Abbasid coinage, which was struck in the name of the Abbasid caliphs, was in circulation in Egypt at the time of the establishment of the Tulunid state. 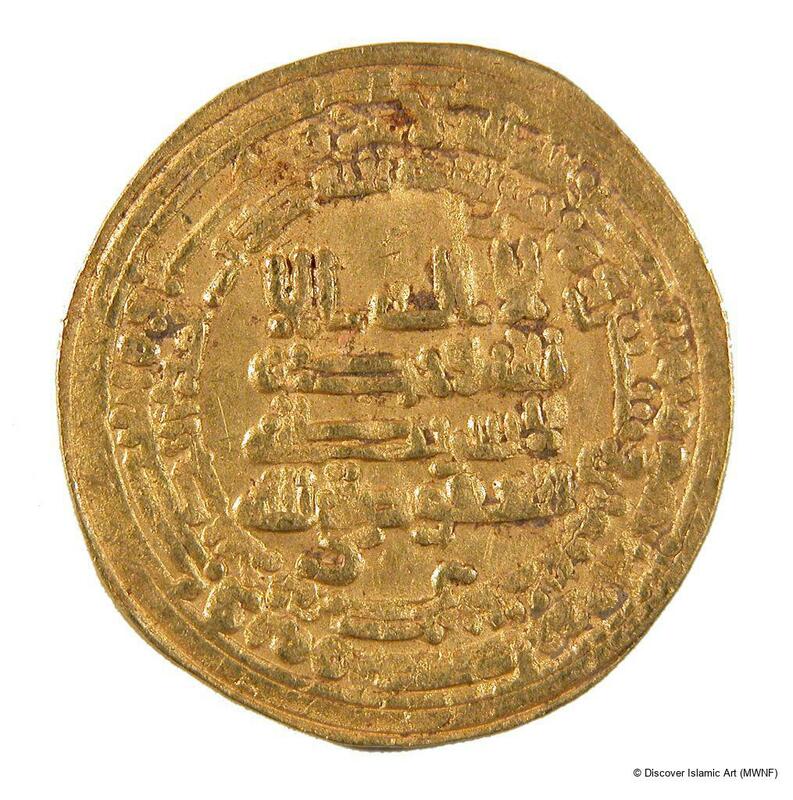 This type of coinage continued in use in the period of Ibn Tulun where Arabic inscriptions and the name of the contemporary Abbasid caliph appeared on the reverse of the coin. In view of the fact that Ibn Tulun did not contest the legitimacy of the Abbasid caliphate, the name of Ahmad ibn Tulun was included under the name of the Abbasid caliph. 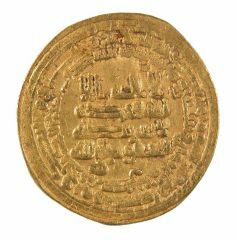 Ibn Tulun was instrumental in purifying gold and raising the standard measure of the Ahmadi dinar to the point where it was accepted as the basis of transactions to the exclusion of all other currencies. Likewise, the Ahmadi dinar continued to be the model that other currencies followed. No alterations occurred subsequently in later caliphates to its standard measure or its inscriptions except for the substitution of the names of the contemporary Abbasid caliph and Tulunid ruler. Coin minting as a sign of power and sovereignty was practised under the Muslim caliphs and sultans, who put their names on the coins. This piece bears the name of the Abbasid caliph and under it we find the name of Ahmad ibn Tulun, the ruler of Egypt. The coin has a date engraved on the reverse: 'In the name of God this coin was struck in Egypt the year 268' (881). The coin was bought in 1961 from an antiquities dealer in Alexandria, Bouy Obeer. Egypt has been narrowed down as the city where the coin was minted in view of the fact that Egypt is named as the place where the coin was struck. Fahmi, Abd al-Rahman, Al-Nukud al-Arabiya: Madiha wa Hadiruha [Arab Currency: Its Past and Present], Cairo, 1964. Fahmi, Abd al-Rahman, Fajr al-Saka al-Arabiya: Mawsua' al-Nukud al-Arabiya wa 'ilm al-Numiyat [The Beginnings of Arabic Minting: An Encyclopaedia of Arabic Currency and the Science of Numismatics], Cairo, 1965. Al-Maqrizi, Taqi al-Din Abi al-Abbas Ahmad ibn Ali (d. 845 / 1442), Al-mawā'iz wa'l-i'tibār bi-dhikr al-khiţaţ wa'l-āthār [Exhortations and Contemplation of the Recollection of Plans and Monuments], Vol. 3, Cairo, Egypt, 1853. Marzuq, Muhammad Abd al-Aziz, Al-Funun al-Zukhrufiya al-Islamiya fi Masr qabl 'asr al-Fatimiyyin [Islamic Decorative Arts in Egypt before the Fatimids], Cairo, 1974. Yasin, Abd al-Nasir, Al-Funun al-Zukhrufiya al-Islamiya fi Masr mundu al-Fath al-'Arabi hatta nihayat al-'Asr al-Fatimi – Dirasa Athariya lil Ta'thirat al-Faniya al-Wafida [Islamic Decorative Arts in Egypt from the Islamic Conquest until the End of the Fatimid Period – An Archaeological Study on Outside Artistic Influences], Alexandria, 2002. He holds a BA in Islamic Antiquities from the Faculty of Art, Cairo University and an MA in the same field from Assiut University. He has been working at the Museum of Islamic Art, Cairo, since 1974 and attended a training course at Vienna Museum in 1977. He has supervised sections of glass and manuscripts and, currently, coins. At the Museum he has participated in preparing exhibitions at home and abroad and has been a member of several inventory committees. From 1988 to 1999 he worked as a lecturer at Om al-Qura University, Mecca, Saudi Arabia, and registered and organised the display of the acquisitions of the Civilisation Museum at the Shari'a and Islamic Studies Faculty at the University. Translation by: Amal Sachedina (from the Arabic).